In its time at Jules Ferry, the Jungle crossed a threshold in the nature of its transgression as a political subject. This transgression was its establishment of community. 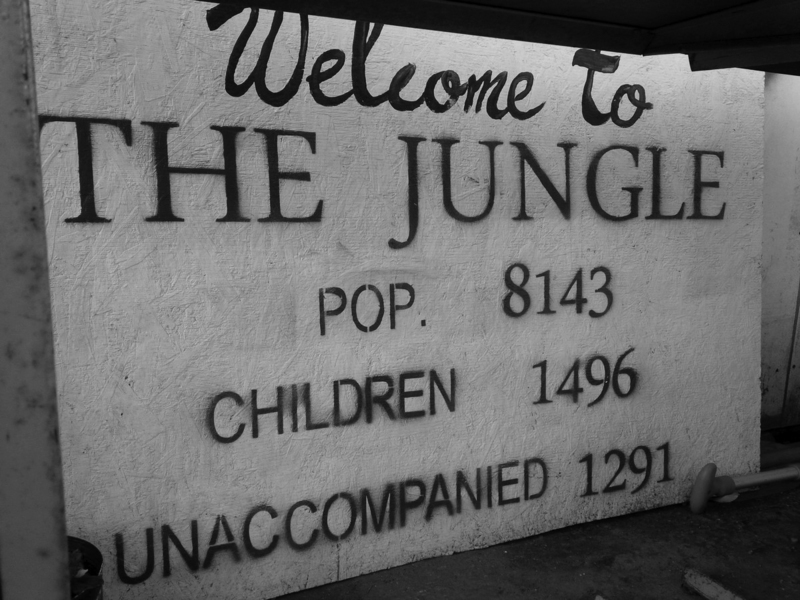 What the Jungle came to embody in political form was a common project; common, that is, in two senses of the word. As a common space for the intersection of multiple social agencies and as the ground for community as being-in-common. Being-in–common was Jean-Luc Nancy’s articulation of community to address its place within modernity and it’s that conception of community that places itself with urgency in the current antagonisms of community in today’s political landscape. Thus a recovery of the Jungle as community through writing becomes a vital exercise. But this has its challenges. This is partly so because the forms of social praxis and agency that produced the Jules Ferry Jungle are not yet understood by modern political institutions or conventions of political writing. 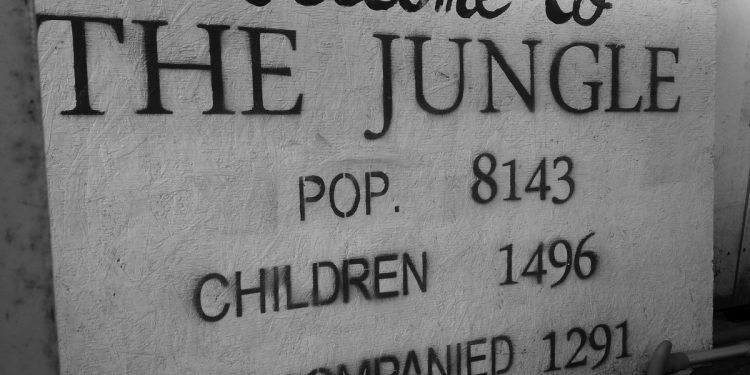 Further, a recovery of the Jungle as community through writing has the challenge of finding the space within the driving narratives of contemporary migration and the refugee crisis. In effect we have a double challenge of writing. To explore this double challenge, this essay draws upon two (unrelated) texts, Slavoj Zizek’s Against the Double Blackmail, Refugees, Terror and Other Troubles with the Neighbours (2016) and Achille Mbembe’s essay The Society of Enmity (2016), that place us in a contemporary reading of Europe’s migration and refugee crises. In Against the Double Blackmail, Zizek argues that the refugee crisis presents Europe an opportunity to redefine itself by acknowledging that large-scale migrations are its future. The ground from which its argument emerges is that of Europe as a liberal project forced to an existential brink by innately incompatible cultures of which the refugee or migrant subject becomes the bearer. The book’s terrain is illustrative of that through a catalogue of propositions, truisms or axioms that bear out the cultural Other; an example being, “[I]t is a simple fact that most of the refugees come from a culture that is incompatible with Western European notions of human rights.” Such examples serve as the taboos we need to face and overcome. Against the Double Blackmail constructs its argument by sifting through an inventory of axioms and taboos in the dark politics of the refugee crisis. Yet out of this, Zizek projects a manifesto for Europe’s future, one that encompasses a greater global struggle. In contrast The Society of Enmity comes out of Mbembe’s past works on Africa as the ‘postcolony,’ its self-realization mired in colonial consciousness. The essay applies itself to Europe via the globalized postcolonial ground. Further the writing, though prophetic in tone, does not construct a project for the future but presents a future already in the present through the colonial past. It is of an Europe that recovers the phantasy of separation and enclosure through the relentless building of walls, fences and camps on its own ground. This we recognize in its making at Jules Ferry, Calais. It is manifest as much by the project of endless fortifications as in the convergence of the “abandoned communities” of austerity Europe and the displaced peoples from war-torn former colonies. On this ground, the struggle over community shapes a new postcolonial terrain and the place of civil agency in it. There also the gathering of agencies coalesced at Jules Ferry. A critique of civil agency runs through Against the Double Blackmail. On the question of its value and the good it does, Zizek paraphrases Winston Churchill: “Sometimes doing the good is not enough, even if it is the best you can do. Sometimes you must do what is required.” On why we help refugees Zizek asks: “[A]re we not doing this to forget what is required?” At one level it may be difficult to correlate Zizek’s identification of agency (liberals acting out their guilt and so forth) with the fundamental need to be a part of the making of the political realities that we believe in. At another, it may be difficult to relate the axioms in his narrative (as for example, “the axiom that sustains the refugees in Calais is not just the freedom to travel but something like ‘everyone has the right to settle in any other part of the world, and the country they move in has to provide for them.’”) to the severe restrictions, destitution and regularized violence faced by Europe’s stateless in their day-to day-lives. In the context of the Jungle, Calais, and the interrelated transformation of both, it becomes all the more necessary to traverse this ground. Zizek does the work for us to reach his “What is to be done?” of the refugee crisis. The answer he offers is solidarity with the Other by way of “a common struggle” without which we would all be lost. The imperative in this “common struggle” is to construct “a positive universal project” that goes beyond global capitalism through the reinvention of communism onto new domains of the Commons. The treaties were the Minority Treaties that granted common rights to all inhabitants of a country without distinction of birth, nationality, language, race or religion. Their failure in practice was the cause of permanent social instability and collapse into war. At the end of the Second World War a new set of legal instruments emerged with the Universal Declaration of Human Rights followed by the Refugee Convention of 1951 which again inscribed rights to displaced stateless peoples without distinction of birth, nationality, language, race or religion. However, they applied only to European refugees. The exclusion of peoples from the colonial world was corrected by the amendments of the October 1967 Protocol but the question of universality remains a structural problem. What we draw from Arendt is that if today’s demographic scale of resettlement in modern Europe has its precedents within a historical continuum, the collateral of universality now arises from colonialism. It is in this respect that Mbembe’s The Society of Enmity is particularly relevant. Mbembe writes “nowhere on Earth has a ‘universal democracy of humanity’ ever existed” and later in the essay he refers to the universal as “the name given to the truth of the victor, or rather, to the violence of the victor, to his wars.” Along this line, Mbembe describes another inauguration: the inauguration of global resettlement as a European project at the root of which nonetheless lay an immanent drive, the “master-desire” of colonial separation. The Society of Enmity extrapolates this master-desire to a horizon we face that is nothing but an immaculate conception of its fulfillment — “when all taboos have been broken, with nothing left to hide everything becomes see-through.” The horizon is the foreordained postcolonial social order instituted by the State of Insecurity, the “permanence of war between us and those who threaten our way of life” and by “nano-racism”, the penetration of race into every facet of civil life. The interrelation of these two pieces, Against the Double Blackmail and The Society of Enmity, place us in clear if divergent trajectories in the crowded narrative space of Europe’s refugee crisis and colonial migration. In one we traverse and overcome the space of axioms and taboos on the way to the future — the new commons. In the other, we are faced with a reversal. The future manifests in the present — a colonial inexorability that now reveals itself in all its nakedness. One projects a future through preconditions of taboos that we have to overcome and in the other, the future manifests as the postcondition of a self-fulfilling master-desire. By interrelating these texts we draw out the preconditions and postconditions that underlie political writing. The exercise draws out an immanence or two-way determinism across the directions of time that contain our imaginary in crisis. But the exercise also serves to open up a political space that escapes each text on its own, an interruption outside of, or beyond the conditions that underlie them. The interrelation of writing helps us understand why the space of the form of community created at Jules Ferry, its political significance, was lost in the multitude of narratives that the Jungle produced. It is also to understand why the space of Nancy’s conception of community in modernity is forsaken when most needed. The Jungle at Jules Ferry existed as an exorcized community — as community that could have no relation to society, community that could be erased. The erasing of community takes place not only through eviction by the State. It also takes place in political writing through conditions that assign its place to the contingent, non-instrumental or without consequence. Writing it as such contributes to the narrative cycle of misconception of community that condemns it to where imagined communities become concrete, antagonisms collapse and elemental forces usurp civil agency. This is reflective of the greater tragedy of community in modernity because in its essence, community as Jean-Luc Nancy would put it, is resistance to immanent power — the “immanentism” that he equates with totalitarianism. Community’s power lies in its capacity to refuse objectification. This is all the more so in consideration of community in displacement; community that builds itself in spite of historical circumstance. But the corollary need not be that such community faces effacement because it cannot be subsumed by prior political trajectories. Instead, by recovering its space, as in this recovery of the Jungle as community, we address the convergence of the challenge of community in modernity and community in displacement out of which comes the conception of community as a subject of historical direction for our times. The Jungle at Jules Ferry in its multiple dimensions of community evolved through its refusal to incapacitate human agency and to explore ways of being in common without the need to fit any ideological jigsaw. It is not only that “ideologies are never interested in the miracle of being,” as Arendt wrote, but that the community it implies is both the means and ends of its goal. We Say No to the "Sacred Union"
Claims to Populism, Danger to Democracy?